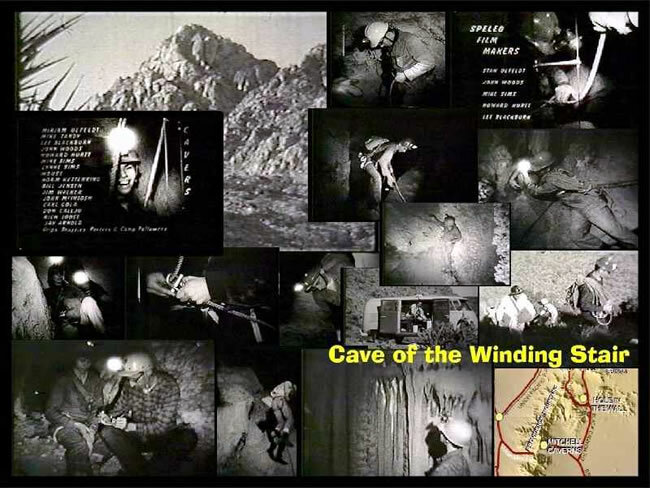 In late 1967 Stanley Ulfeldt, the Southern California Chairman of the National Speleological Society, proposed the making of the documentary film Cave of the Winding Stair. A shooting script was drafted and the first filming began in 1968. Ulfeldt’s selection of 16mm high-speed black and white film allowed the use of only one auxiliary light during filming. The bulk of the picture was made solely by the caver’s headlamp illumination. Ulfeldt’s dedication to authenticity produced one of the most realistic films on caving made to date and also the first major caving film ever made in the Western U.S. All of the vertical techniques and equipment in the film are authentic to the period and Cave of the Winding Stair is a remarkable historical document of the period of changeover from the 1950’s cable ladder era to the beginnings of modern single rope techniques. An actual rescue during one production trip also became the first confirmed cave rescue ever to be filmed in the U.S. Ulfeldt’s remarkable foresight has created a lasting document of the cavers and the techniques of 1960’s caving in the West. This film is now avaiable on DVD and VHS. Please allow three weeks delivery time. Copyright © 2019 The Underground World of Caves. Powered by WordPress. Theme: Spacious by ThemeGrill.